Warehouse management has emerged as a determinant for success of global supply chain management. 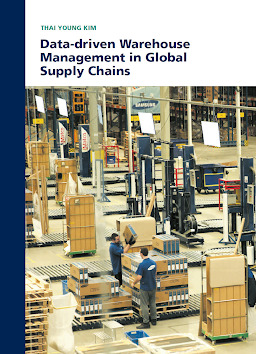 This thesis focuses on how to solve warehouse challenges in global supply chain management (SCM) that is characterized by large volume uncertainty, great responsiveness needs and complex order-fulfilment collaboration with other functionalities. We employ data analytic methods to exploit the rich data information obtained from detailed registration of daily warehouse operations to address these challenges. By providing actual application examples in real-world situations we showcase the potency of such data-driven warehouse management. In this dissertation, data-driven warehouse management is presented by four-steps in the time horizon of warehouse operations: Long-term opportunities (for the coming years) are examined by predictive analytics for expanding cross-border e-commerce in the European Union. Mid-term demand for spare parts during the end-of-life phase (of several months) are forecasted by means of data-driven modelling for installed base. Short-term operational opportunity (weekly or daily) are presented by employing detailed productivity data to sustain effective operation of variable warehouse resources. Real-time (hourly or shorter) data applications are introduced for job priority allocation to improve daily responsiveness in warehouse order fulfilment. All these data analytic methods can be incorporated in warehouse management systems where practitioners can tune the specific strategies according to their warehouse constraints, including location cost, labour cost, time criticality, and freight company flexibility. In this way, data analytics at the warehouse level offers great opportunities for managing increasing uncertainties and performance requirements in global SCM.